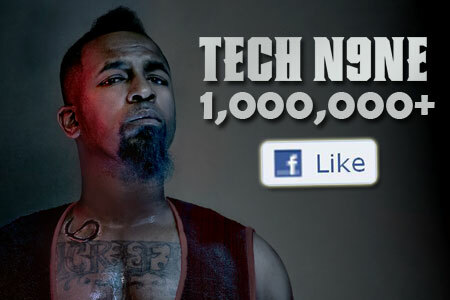 Just in time for his breakout season, Tech N9ne has reached another milestone in his career by garnering over 1 million likes on Facebook page. As Tech’s monumental album All 6’s and 7’s attains a buzz that spreads into popular culture, his fanbase grows at an ever-exponential rate, to which this figure is only the beginning. Let us remember that this number is only a figure that gives us a reason to celebrate how far Tech N9ne has come. What is more important is how he got here, by sharing his life through song to the point that it has touched people on a level deeper than any pop song could ever hope to attain. We’re here because we identify with an artist whose art imitates life, who has never shied away from bleeding on the beat, and whose resonance can be felt around the world. This milestone would have never been achieved had it not been for the die-hard and loyal fanbase of Technicians that have followed Tech since the get go. Tech N9ne has always kept this close to heart and will never waver his undying loyalty to the wonderful people across the globe that given him a thriving career based solely on artistic integrity and self-expression. Here’s to you Tech N9ne: may the best of your past be The Worst of your future!